The two weeks dedicated to WE – Women for Expo ended with a big and colored ceremony, in which Creativi Digitali with the brand Flash Mob Milano played the role of coordinator of the parade through the Decumano, in which took part more than 400 women from all over the world, and of the final mass choreography at the Expo Center. The event production was committed to (h)films, and due to the big success in terms of participation and realization of the “Orgoglio Italia” Parade of Tuesday 2nd of June 2015, also this time there was the participation as Music Consultant of the Music Consulting Company Milano Music Consulting, under the guidelines of the director Marco Boarino, and the team of Flash Mob Milano, consisted of 20 members among which 4 staff members and 16 trainers, starting from early morning dealt with the organization of the materials for the event, the coordination of the parade and of the final mass choreography, speaking with the event participants in Italian, English, Spanish and French. 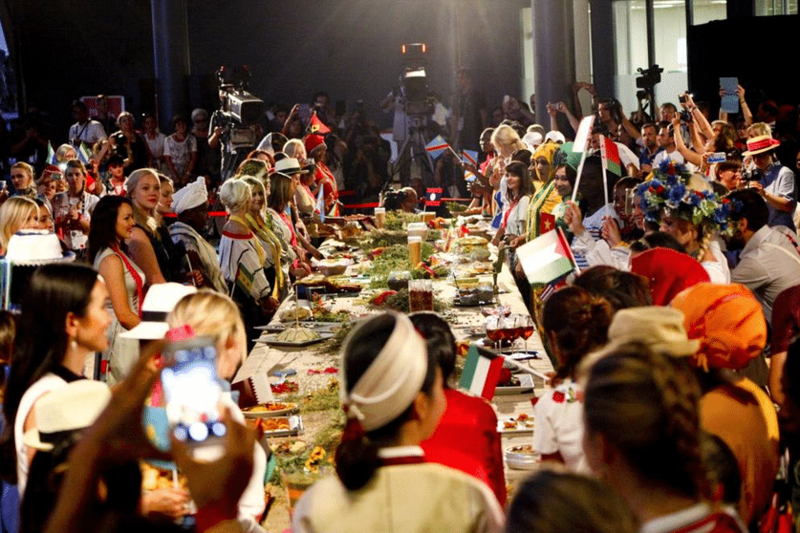 More than 400 women dressed with their traditional costumes, members of all the participating Nations in Expo Milano 2015, met in Piazza Italia at around 20:00 to take the material distributed by our trainers, including little flags of their Countries and yellow and pink colored ribbons, with the colors of WE – Women for Expo (the Expo Milano 2015 project in collaboration with the Ministry of Foreign Affairs and International Cooperation and the Arnoldo and Alberto Mondadori Foundation), and then they paraded in a big and colored procession until the Expo Center. Leading the parade, the choreographer Cristina Usai and the logistics director William Sala, with the fun female marching band Girlesque StreetBand, opened the procession accompanied by the Ambassador Mariagrazia Cucinotta, Martina Colombari, Maurizia Cacciatori and Samya Abbary. The cheerful parade ended at the Expo Center, where there was the “Tavola del Mondo” (World’s Table) which was filled by various typical kinds of food showed through the Decumano, where our trainers coordinated the “fountain” choreography, and there was the speech of the Honorary President of Women for Expo Emma Bonino and the Executive President Marta Dassù. An event full of symbolic gestures, filmed live by the cameramen of Expo Rai and ours cameramen; waiting for the official video of the event, it was published on the YouTube channel of Creativi Digitali a 70” trailer that summarizes some of the activities carried out by our team of Flash Mob Milano during that day.